The end of treatment bell is the goal that everyone at Children with Cancer UK works towards, however, the fundraising, research and treatment are steps that drive a child to this moment. Back in 2013, eight year old Emma was diagnosed with rhabdomyosarcoma – a soft tissue sarcoma. Soft tissue sarcomas account for 7% of childhood cancers. Following a nine-hour operation to remove the tumour and a three day chemo course, Emma and her family flew to Oklahoma for Proton Beam Therapy – courtesy of the NHS. During their time in Oklahoma, they saw lots of patients ringing a bell after finishing their treatment. They couldn’t wait for Emma’s turn. Finally, after her last dose of Proton Beam Therapy, it was Emma’s turn to ring end of treatment bell. Back in Britain, Emma’s family looked forward to the day when she would finish chemotherapy. They showed the bell to the nurses who agreed it was a fantastic idea. So a bell was made in time for Emma’s last chemo and she was the first to ring it at Manchester. Since then, the bell has been rung by thousands of patients and now has it’s own facebook page! End of treatment bells for all hospitals. Emma is now three and a half years out of treatment and doing well. She loves school, dancing, singing and drawing. 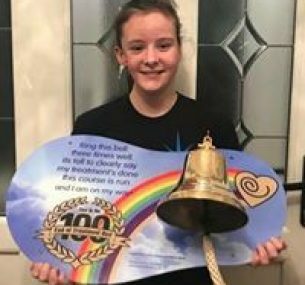 In the meantime, Mum Tracey has been raising money to provide End of Treatment Bells for hospitals throughout Britain – so everyone can feel the joy of ringing The End of Treatment Bell. She does this through the Maria Watt Birmingham Foundation and has so far provided 148 End of Treatment Bells. 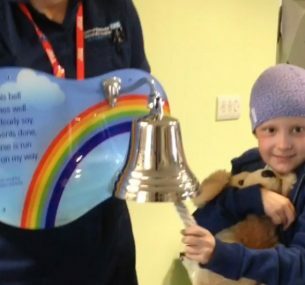 For a child with cancer, ringing the bell is a huge milestone. It means they’ve finished their treatment and are ready to get on with life.